WHAT IS COMPILING? WHO ARE AGGREGATORS & PORTALS AND WHY IS THIS IMPORTANT TO SELLING MY HOME? HOUSTON’s MLS is one of the best in the world. People come from all over the world to study how our MLS system was built, its features, and its online capabilities. It is a powerful tool to assist you in the rapid and satisfying sale of your home. MLS (Multiple Listing Service) is basically a huge database of all the properties for sale in Houston. It is administered by HAR (Houston Association of Realtors). 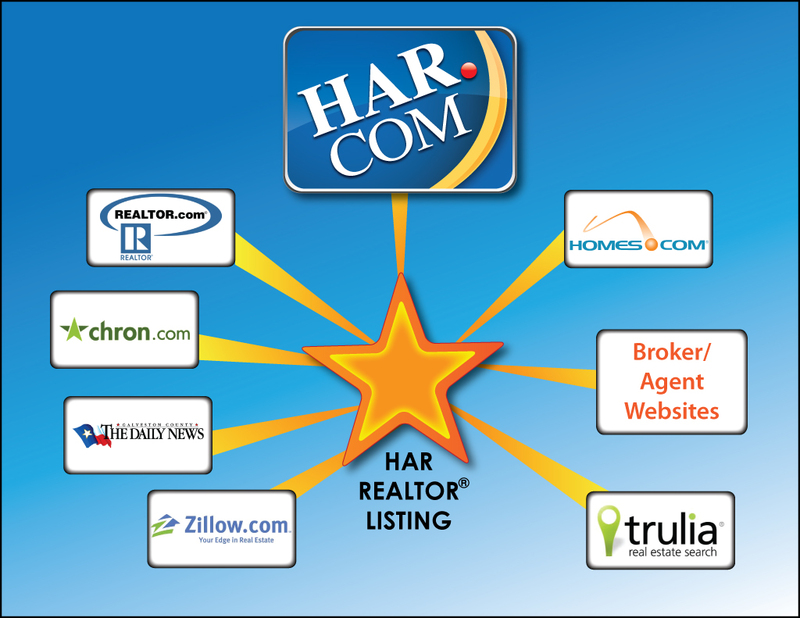 ALL listings must be submitted to HAR for inclusion in the MLS database. An agent who witholds a listing from MLS without the express (written) consent of the seller risks significant penalties and may put their own license, and that of their broker in jeopardy. HAR makes this database available to the public … anyone can see this data on their web page www.har.com; it is FREE, you should visit. In addition to maintaining the database, HAR also exports the database to other websites. Compiling is a computer program that translates the data from our MLS and writes it in a form that is acceptable to other sites. It “packs a suitcase” for the data so it can travel to other sites, as seen in the graphic on the right. They have a subscription with HAR where the data is streamed to them out of HAR.com on a regular schedule several times a day. So the data is the same, but what IS different is the “face” they put in front of it. Each portal writes their own code on how to display this data to you, they customize the “look” …. and it will likely have things like their own specific logo on it, and will usually include links to their own agents, and agent office locations. Prior to giving you access to the listings on a portal, there might be an area where they ask for personal contact information …. you know — name, address, phone number, etc. — this is known as lead generation. They want to know who you are so they can follow up with you at a later date. HAR.com NEVER requires you to give any contact information in order to have access to the listing information. If you don’t want to give this information, you don’t have to; just go to the public access site at www.har.com and view ALL THE SAME listings, without being processed through a lead generator. Also, be aware a portal may or may not have all the features, or even the newest features that HAR.com has. Why? Whenever HAR incorporates new features on their site, each portal needs to have someone write code in order for the new feature to show up on their own portal — Brokers may delay doing that —- so a portal may not have all the bells & whistles available on HAR.com. Aggregators are “super sites”…. they collect and join together the data from multiple MLS’s across the country and around the world. Our own MLS generally has about 50,000 listings in it, and hosts est. 1/2 a million visitors each month. As an example of an aggregator, www.Realtor.com is the official site of NAR (National Association of Realtors) and they have over 1000 MLS’s combined together into a database, and host est. 8 MILLION visitors each month searching for homes. When you hear someone talk about “integrated MLS’s” all that means is they are referring to an aggregator which has collected and combined multiple MLS’s into a single searchable site. WHY IS THIS IMPORTANT TO HOME SELLERS? Choose a Listing Agent who not only understands all this, but is conversant with this technology. You want a Listing Agent who knows how to create marketing materials that can be compiled and included in Aggregators….. like SMARTePLANS. You WANT your home’s data to be available to 10 million+ people a month. Ask them to show you what they do …. ask them to open up online examples. What about specialty web sites? Is your home waterfront property (either lakeside or seaside)?, a historic home?, a Victorian home?, a Large estate or compound?, perhaps a golf-course home? There are specialty web sites dedicated to these types of properties. Is your agent “hooked in” to these sites to promote your property via DIRECT online access to Buyers and Buyers Agents who specifically come to these sites to find their next home? Does your Agent know how to do that? Ask them.